This was a sports-themed baby shower and the client wanted a main cake as well as cake truffles to give away as shower favor. The bottom tier of the cake was Belgian chocolate covered with chocolate buttercream, and the top layer was red velvet covered white buttercream. I started covering the bottom layer with different stripes of brown and blue (two different widths of blue), then covered the entire top tier with a piece of blue fondant before decorating it. I pretty much had to mix and knead the blue, orange, and brown colors of fondant. The decorations on top were made of a mixture of white chocolate and fondant. The baseball cap with a "W" is made of fondant, as is the basketball. 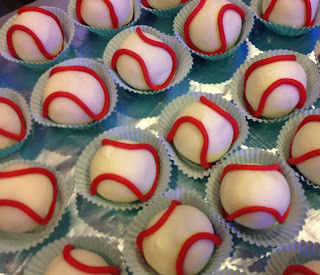 The golf ball and baseball were solid pieces of white chocolate; the red on the baseball is fondant. 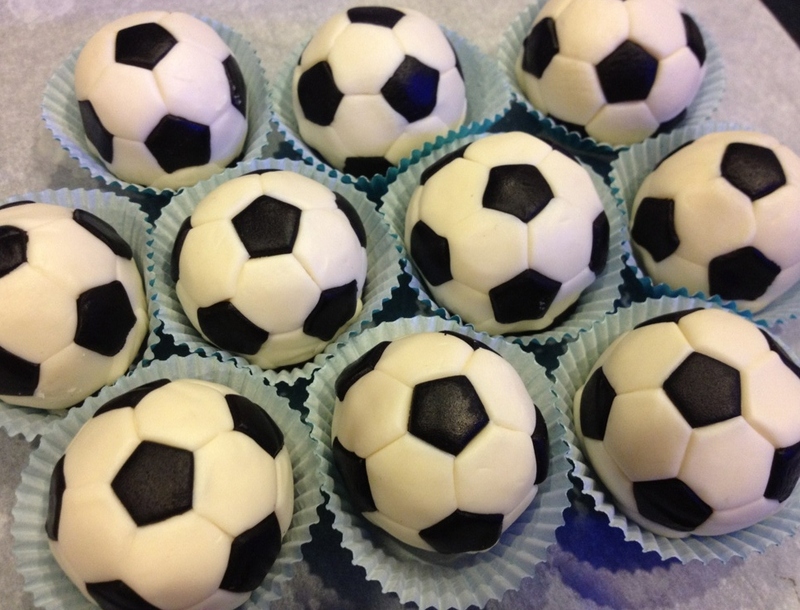 For the soccer ball, the base was also a solid piece of white chocolate, but then it was covered by individual pieces of black and white fondant to achieve the soccer pattern. For the party favors, I created 35 plain baby blue cake truffles dusted with light blue shimmer (not pictured). These were cookies and cream...yummy! 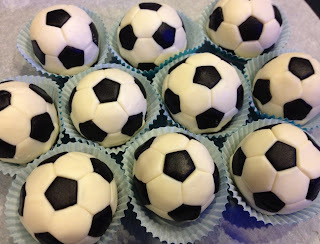 I also made 25 baseballs and 10 soccer balls that were butter cake on the inside. The soccer balls took the longest because I had place each hexagon and pentagon on individually. I hope everyone had a blast at the baby shower!